48-hour snowfall totals ending at 8 AM on March 22. Areas shaded dark orange and red received more than 12 inches of snow. Click to enlarge. Map credit: NOAA’s National Operational Hydrologic Remote Sensing Center. Twelve of the 35 major climate sites set a daily snowfall record for March 21. The daily snowfall also ranked among the ten greatest one-day snowfalls for March at 10 major climate sites. 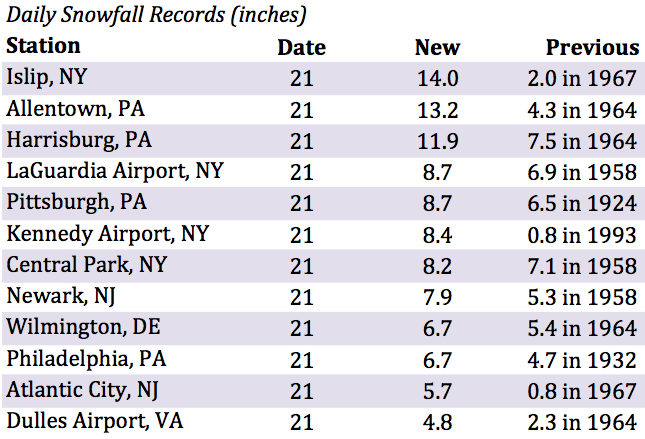 In fact, for Islip and Kennedy Airport in New York, it was the second largest one-day snowfall for March on record. In addition, the snowfall pushed Islip’s monthly total into record territory. The site (as of March 21) has seen 27.5 inches of snow this March, beating the previous record of 23.3 inches set back in March 1967. Daily snowfall records were set at 12 major climate sites. March 21 snowfall and how it ranked among the greatest one-day snowfalls for March at several sites. The storm led to tens of thousands of power outages, numerous accidents, more than 5,000 cancelled or delayed flights, and minor to moderate coastal flooding. There has been at least one other time when four nor’easters hit within four weeks. According to NOAA’s Weather Prediction Center, a similar situation occurred between December 30, 1986 and January 26, 1987. 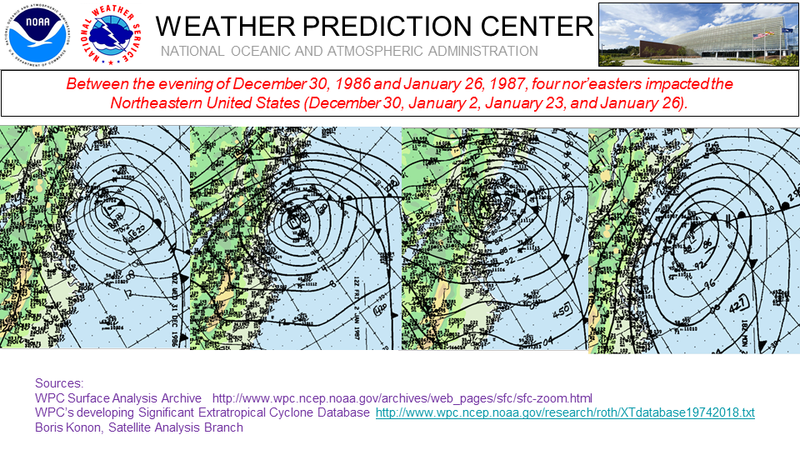 Four nor’easters impacted the Northeast from late December 1986 through late January 1987.